one cannot short the name Aya much, so she prefers to simply go by that. she is not opposed to non-derogatory nicknames being given to her, though, and actually finds them rather endearing. not much of a surprise, but isn't strange for her to give nicknames to people she spends a fair amount of time with. Aya is eighteen, and appears to be that age. Aya's hair is long in length, but a purplish color. her hair is soft to the touch and silky. Her hair is kept down, but there are times - no matter how rare - that she will pull it back into a sloppy ponytail or bun. her eyes are a piercing blue in color and expressive. her skin has always rejected the sun's rays, leaving it rather pale; however, Aya's skin is also smooth to the touch. Aya is fairly short in height, and her body is slender and lithe. though she is obviously a female, Aya's slender figure leaves her a little... lacking in the chest area. Akako wears a lavender skirt that comes down to her knees, black tights, and a cream colored shirt. her footwear consists of comfortable boots that come up mid-calf, and she wears a black jacket that is just a little bit too big for her. Aya is a quiet, observant person who is occasionally seen as shy. she has a huge interest in the beauty of art, and often carries a sketchbook with her. the art gallery itself was terribly interesting to her, and, before everything happened, Aya was originally there to immerse herself in the peace that comes from observing such masterpieces. common characteristics of Aya are smudges of graphite or charcoal along her cheeks from attempts to push her hair behind her ear, or paint and ink stains on her fingers and palms - all traits of a girl hard at work on her latest piece. Aya, once she has become familiar and comfortable with a person or situation, often exudes a subtle and soft charisma. she is thoughtful yet impulsive, intuitive and instinctual. friendships are things that are both dear and foreign to her. she has never had many - if any, for all she knows - but she generally takes friendships seriously. diligent, Aya isn't easily swayed from the tasks she has set out for herself and often pushes herself harder than she needs to. due to this, Aya is also occasionally crafty thanks to her quick-wit, but this isn't always obvious upon first meeting her. yasashii rei. yasashii meaning gentle, easy, or kind. lifeless, just to match his usual blank expression. gratitude, appreciation. a pink rose. finds self denial absolutely hilarious on the inside. his mouth turned down, his grey eyes piercing the space ahead of him, Rei remained silent standing by himself as he studied the row of paintings on the wall ahead of him. they where all beautifully made, depicting different emotions and experience through the artiste's life. hands at his side, Rei suddenly snapped out of his trance like state, staring at the white wall now. lip trembling slightly, the college student lowered his head, stopping from standing on his toes to get a better view, before turning his back to the wall and walking on. checking his watch quickly to not seem as if he was being impatient or rude, Rei walked past a small crowd of fancily dressed people without a second glance. he had come here with a small group of other art students, but had gotten separated during the time he spent being distracted by the other pieces of art. adjusting his tie, he headed down to a more empty part of the museum, eyes glued to look at all the paintings in their designed frames, and despite them just being a heck amount of paint designed to make something, Rei found them something even more. he felt so strongly about them, as if they where real. running a hand through the strands of hair which parted for his finger's, he was nearly near the exit of the area until he noticed one last exhibit he had missed. tilting his head, Rei quickly headed over wondering how he missed it. just as he took a step into the room, it felt so much more.. empty. more colder in this room. shifting a bit in the place he was standing, Rei looked around only seeing one person in here, wondering if this was a good idea as he took another few hesitant steps inside. in the silence the two stood in, Rei walked over to the lone painting, turning his head to glance at it and giving a small gasp under his breath just at the sight alone. it was a beautiful painting, a beautiful painting of a girl who seemed to be laying in a small batch of lavender flower's, roses to be specific. lost in the piece of art, a small voice had caught his attention, making him break his gaze. "it's called the forgotten portrait.. I always did wonder why, what's the meaning of this?" the stranger whispered under their breath, looking up at the painting, before adding; "could they be dead?" Rei gave a small cringe at this, feeling more and more uncomfortable by the minute he spent with them. shrugging in response deciding it would be best to stay quiet, he turned his hardened gaze back to the painting, looking into how detailed it was and how it seemed so.. realistic. "maybe the artist doesn't even know." Rei blandly said, voice hushed. the awkward silence continued upon the two, before the stranger without another word turned and left the room, leaving Rei and the painting. sighing seeing he was alone once again, Rei turned on his heels, ready to leave the room as well. there was not much else to do here anyway, still, the painting definitely impressed him. it was burned into his mind, maybe he would be inspired to do something later. was that the whole reason they had come here? to get inspired, just as Rei was about to step out of the room, almost immediately as he took a step away the lights in the room had began to flicker, before it grew dim. a blackout? well, there where a lot of exhibits to light... still, Rei did find this strange. the noise seemed to grow silent as well, and soon it was as if everyone had gone. trying to resist the urge to build up a panic attack, Rei took a deep breath, standing there in the dark, but something made him even more uncomfortable. it seemed the light for one painting hadn't been effected at all, the one of the lavender girl. the forgotten portrait was still lit. The thin figure - female, sat up, covered in the petals of lavender roses. She looked around with a slightly dazed look in her eyes, curious as to where she was and where the voice seemed to be coming from. Looking beside her, the girl took in the sight of the framed painting. More lavender roses poked around from the painting, and there was a seeming hole in the middle which was burnt and scraped. The girl narrowed her eyes a little at the sight, as it seemed as if that was where she had fallen from. I've been waiting for you forever!" The girl looked upwards, trying to find the source of the voice. It seemed she couldn't find it, but still she said, "Play with you? I can't even see you... Where am I? The voice laughed a broken, gravelly laugh and answered, "This is world you live in!" It wasn't a very good explanation, but by now, all the girl could think about was how she couldn't remember... anything, not even her name. Looking to the voice again, she asked, "W-What's my name?" Again, the voice laughed again. "You don't have a name! How ridiculous... Take a look at your title!" Confused again, the girl looked at the title under the painting. It read, 'Forgotten Portrait' on the plaque. "Since you're forgotten, you obviously don't have a name!" The voice called. The girl rubbed the back of her head. "That's a bit odd, don't you think?" "No, I don't," the voice answered. "Now let's play!" The girl ignored the voice, standing up and looking at the painting. "I have to get out of here," she said. "I have to get going." "You want to leave? Really?" The girl stared at the boy on the other side of the portrait, her blue gaze focusing on his face. "That one..." She said, her gaze never leaving the boy's face. "You want that boy?" The voice questioned. "He intrigues me... for some reason," she explained. "His name is Rei... It seems he will be the boy that will get you out of here!" The voice proclaimed. Cupping her face in her hand, the girl hummed quietly. "Will it really work?" "This is how the ruler before you got out!" "I see...." The girl said. "I'm sorry about this, Rei... It's nothing personal, really... But I... I have to get out of here." "Then let's get ready to welcome him!" The voice cackled. "We will create a labyrinth to ensnare him! Ah, how fun! It's time for the birth of a new labyrinth! This time, it's the Queen of the Lavender Rose!" Once the lights had flickered off, the portrait of the forgotten girl remained lit by the soft light. It cast a glow upon the artwork, giving a clear view to how the painting had changed. While her eyes had initially been closed, they now opened to look to the boy who watched her. The corners of the girl's mouth turned upwards into a welcoming, friendly smile. A few petals of purple drifted down from the portrait, carried as if by a breeze to the young boy. "Come.... Rei," the girl said softly, holding out a hand towards the boy. it seemed time went slower as Rei tried to walk away, as if he was moving in slow motion away from everything. it was like he was stuck there, helpless. it was so hard to not call out for someone else, hard to stay silent instead of yell for help. but even if he wanted to do so, his voice wouldn't rattle out at all, as if his mouth was sealed shut. with a shaking figure, Rei stood there in silence, watching carefully and intensely as the painting had seemed to come to life. and it moved. the eyes where now open, and Rei watched all of this in complete horror, mouth open in the shape of a small "o", but no words where able to come out. stumbling backwards, tripping over his own feet and falling onto the floor, Rei looked at the petals that had exited the painting, captivated now at the girl's eyes that had been revealed. as they smiled, it seemed time had stopped, as well as Rei's heart which felt like it dropped into his stomach too. gulping, Rei listened as the girl had told him something that he had missed, just too caught up in the moment to hear. watching her mouth the words, his ears suddenly popped and he was back into reality. the lavender girl was still there. 'is this even real..?' Rei questioned himself, a pit feeling that this was a dream growing deep inside him. well, if it was a dream, might as well roll with it, right? the girl had even known his name, how? and also, why? feeling as he was slowing her down for something, Rei didn't bother to rush as he got up from the floor, still trying to process everything happening as he did so making him even more slow. now standing on his legs which felt as if they would snap from under him, Rei took a few small steps toward the painting, stepping over the petals avoiding them and looking down at the hand she held out to him, probably. it felt so real, and made Rei question what was real. was he even alive now? holding his hand out, it took Rei a few seconds to actually lower it into the other's, and surely, it was real. she was no longer a painting, Rei could feel the hand. now that he had taken it, a swirl of regret rang through him up his spine into his heart and head, causing his upper body to throb in both exciting anticipation, and fright, pure fright. "okay." was all he said, no need to add anymore. they knew his name so introduction would be needed. so he accepted her hand, now what will happen? would he be blasted through time and space? pulled into the painting with her? The forgotten girl smiled a little bit more as the boy came over to where she stood within the painting. She had wondered at first if he would even come to her, if he would instead just turn and run away. She supposed it would be a completely human-like reaction to do such a thing, to run from something that you don't understand. A painting had just come to life in front of him, and now beckoned for him to come to her. And yet the boy, Rei, as the voice had called him, walked over to her. Though her expression remained calm and friendly, the girl found herself feeling a little victorious that the boy had actually come to her. Perhaps there was some sort of allure or magic to the painting she was trapped in that brought him to her. She didn't know, and she supposed that it did not matter, because once she felt the boy accept her extended hand, the lavender girl carefully wrapped her fingers around his. She smiled still, nodding her head once to him in reassurance. And then, gently, she pulled the boy into the painting with her. She did not know exactly how she would switch places with him, as the voice had simply told her that she needed to bring Rei into the painting, but perhaps that would be the only thing she would need to do. Perhaps, once she had brought the boy into the painting and through the labyrinth, then she would be allowed to leave. The very thought of getting to go outside the painting, back into the real world, was exhilarating, and she was almost afraid to hope that it could be so easy. These thoughts and more filled her mind like a swirling pool of water as she brought Rei into the painting with her. And then, just like the blink of an eye, everything changed and suddenly the thoughts were gone - just like the memories of the forgotten girl. Sprawled on the ground on the other side of the painting, the lavender girl was distinctly aware of a weight on her body - that of another body. Frankly, it felt quite uncomfortable and her shoulder hurt a little bit from the obvious fall she must have taken. Opening her eyes, the girl's gaze landed on a boy. She wasn't exactly sure who he was or where they were, but she wasn't particularly concerned with that right now. By now, the lavender girl had forgotten everything from before - again. She had forgotten the voice, she had forgotten her role as ruler of this strange world, and she had forgotten luring the boy into the painting. Once more her memories had been stolen from her, leaving her dazed and confused in this gallery world. Something about bringing the boy into the world with her had erased the memories, and whether this was natural, or the work of that pesky voice, no one could tell or know. The lavender roses were gone, the petals that had once littered the floor on this side of the painting seemingly swept away by some unknown broom. But it wasn't like she could remember that. Not now, anyway. "Could you please move?" She asked, feeling the slight throb of pain in her shoulder start to ebb away. She supposed she hadn't hurt it that bad, but when she fell she supposed that she must have landed on that. No matter, it didn't even hurt that much in the first place, so she would be fine. looking around the new area he was in, Rei found himself sitting on the ground, no it was something. not paying attention to what he was on though, Rei was more focused on studying the area that surrounded him, wondering where he had gone off to. all he could remember was that he was in the museum, and now he was here. holding his head which for some reason hurt, he was about to pull himself to his feet to get up, but a small voice from under him interrupted him. listening to the small question, Rei looked down at the girl, he rolled off without another breath, knowing it was somehow rude for him to sit on her. "yeah, sorry." Rei softly apologized, bowing his head as he slowly got onto his feet, hands placed at his sides. his grey eyes scanned over the area, the place seeming like some gallery. was he still in the museum? turning to face the girl, Rei stared at her with a confused gaze, not saying a word, still trying to think of what he should say. there wasn't anything he could think of that seemed normal. "this looks like the gallery in the museum, but it seems much more.." Rei said, unsure what to say about this. it seemed much more ominous, as if something could leap out at him any second. "it seems less clean." clean? what did he mean by that? "i don't know what i'm saying." Rei rubbed the back of his neck, looking down at his feet but another sight caught his attention. the sight of a rose placed in his pocket, the color of it a bright pink. narrowing his eyes, Rei reached down to get hold of it, carefully putting his grip around the small thorns that where littered over the vine. it was pretty, yet holding it made Rei feel was if he was holding a responsibility, a life for some reason. he couldn't remember if he had brought it with him or not, but felt as if it wasn't originally with him. wondering what to do with it, Rei once again looked down at the girl. at least he knew his name, maybe he could give her that. "i'm deeply sorry for sitting on you. i have no clue of how that happened, but i guess it was my fault." he sighed after saying this, not liking apologies but some people preferred them. and it seemed there was no nearby escape, so he would either have to stick with this girl, or go off alone and risk his life. both seemed dangerous, but at least with her it wouldn't be so lonely. 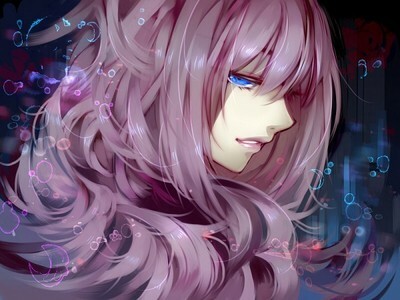 Once the boy had gotten off of her, the lavender girl sat up, looking around and rubbing at her shoulder absentmindedly. The place itself resembled an art gallery, only a warped version of one. The white walls had large roses of gray painted onto them intermittently, and upon these walls were portraits. Some of the paintings had actual work on them, and others were just a canvas painted completely black. It was rather unsettling, but it made her curious. She agreed with the boy that it seemed to be less clean, yet neither did it appear dirty to her. The atmosphere was not as peacefully quiet, full of the feeling of hard work and beauty, like most galleries. This place seemed to be entrancingly dangerous. It was quiet, but not in a reassuring sort of way, and the beauty depicted was wrangled and morphed into something that was as frightening as it was alluring. Honestly, the girl could not decide whether she liked this place or didn't - but she did know that she wanted out of here as quick as possible. Remaining here would no doubt be a bad thing, and she really didn't want to find out what would become of them should they linger about. Just as she was about to stand up, the girl's hand touched something that made her immediately draw her hand away. Looking to whatever had almost pricked her, the girl quirked an eyebrow to see the lavender rose. Picking it up tenderly, she looked over the green stem, the little thorns that protruded from it, and the soft, lavender petals that adorned it. As if connected, her gaze immediately went from the flower to the painting before her. It was a very large painting, depicting two roses surrounded by a mass of thorns. The colors of the roses were, surprisingly, purple and pink. Blinking, the nameless girl stood up and examined the painting. No longer could one see out into the art gallery through this portrait, and instead of the plaque below it reading 'Forgotten Portrait', the painting's name was 'An Impossible Dream'. As strange as she thought it was, the girl looked from the painting to the boy. His apology, though appreciated, wasn't exactly needed. She was more interested in finding more out about this maze than why it was he had fallen on her. Besides, no one had gotten badly hurt, so she had brushed the incident off easily enough. "It's fine.... But where did you come from?" She asked, tilting her head to the side questioningly. She turned her gaze back to the painting, and her expression seemed to imply that she was wondering if the portrait had been the entrance. Reaching out a careful hand, she went to touch the painting, to see if perhaps it was a trick and this was a door of some kind. Perhaps they would not actually have to go through the frightening maze at all, and could simply leave through the portrait. However, just when the tips of her fingers came within an inch of touching the painting of the two roses, the thorny vines moved and distorted a bit. They seemed to reach out towards the girl's hand, which elicited a quiet yelp of surprise from her as she jumped back a little in the direction of the boy. "Maybe not..." She muttered quietly to herself, staring at the painting as the thorns once more sunk into the canvas. nervously shifting in the spot he was standing in, Rei held his aching stomach, just wanting to go home. everything about this felt like some kind of trap, it had to be the ambience, the eerie like atmosphere. it was almost inhuman in some way, despite it being a gallery. glancing at the girl, he noticed she looked around as well, so he remained patient and decided to wait for her to say something. 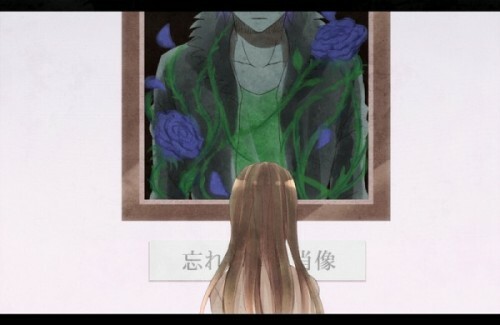 as she was focused on the lavender colored rose she had, Rei walked over to the painting they where nearest to, trying to examine it without touching it. "i wonder..." Rei tilted his head, curiously wondering about it. would something happen if it was taken down? reaching his hand out, Rei was just about to stuff it in but stopped right in front of the canvas, holding his breath as he stared into it. was that really a good idea? standing still for what seemed like a hour but was just a few seconds, Rei decided to lower his hand away from it. looking at the girl he appeared to be stuck in this with, Rei glanced down at his rose wondering what in the world was he supposed to do with it. twirling it in his hands, he walked back over to the portrait, studying the things on it. the roses, the thorns, did it mean something? would it pop out and somehow kill or injure him? looking down at the plaque for a hint, Rei read it a few times trying to think of something from his books. "an impossible dream.." he thought out loud, not getting anything. did he not study enough? hearing her speak up, Rei remained silent, thinking about the question. he came from the museum, right? is that where she came from? hopefully they did, because once again, Rei couldn't remember what had happened. maybe this was some kind of joke. although, his friends where usually very sophisticated and didn't seem like the kind to put so much work into a simple prank. once again at a stump, Rei stood there trying to guess what had happened but finding nothing. "i think i came from a museum. i wouldn't know where else though." did he make a wish or something? with a soft sigh, Rei gave up trying to figure this all out, his brain now half fried just from trying to for a few minutes. watching quietly as the girl had reached out, probably going to see what they could do with the painting, Rei didn't object anything despite him not wanting to touch it. maybe they could do something about it, they seemed to have the courage to do so. just as he was about to look away towards the long hall ahead of them, the only way that seemed to lead somewhere, his eyes widened as the tip of her finger's had settled into the painting, but he stumbled back from surprise when the painting had moved around, aiming for her hand and it was pulled out. "maybe we came from the painting." he said, holding his chest with a shaking hand trying not to show he had been frightened by a few events. if this was only the beginning, surely there would be more to come. 'if i have to go through this, my health will surely drop.' Rei negatively thought, frowning. "just kidding. it looks like the only other option i or we have is to go down there.." Rei trailed off, gesturing at the hall that seemed to lead down to somewhere. "is your, uhm, hand okay?" Rei nervously asked, not bothering to look at her, but instead faced forward ready to head in. The idea that they came from the painting sounded a little off, but since there were so many things about their current situation that were technically 'off' as well, she knew shouldn't rule that out as a possibility. Looking back to the painting that had previously reached out to grab her hand, the nameless girl stared at it for a few seconds, wondering over the likability of having come from the painting. It did portray two roses of the same colors that she and the boy had. Turning her gaze down to the flower in her hand, she studied that as well. Of what importance did this little flower hold? She had no recollection of ever possessing it before, so was it given to her by this strange world they seemed to be trapped in? Her instinct was telling her that this rose was indeed important to her, but not exactly how or in what way. Was it supposed to be a clue or something that would lead them through the maze? Or were they nothing more than a sort of ticket for getting in? The latter idea seemed too unimportant to be possible, but she was still left without a concrete answer either way. Like the painting had said, this was all turning out to be an impossible dream. But then, was she actually dreaming? It didn't feel like a dream, and seeing as how this boy also seemed confused by his surroundings, she would assume it wasn't. The girl could not remember any dreams she had once had - something she found to be particularly strange - but she was sure that this could not be just a figment of her unconscious mind's imagination. "Yes, the museum. How strange..." her voice was quiet, hardly above a whisper and really nothing more than a thought spoken aloud. The girl gazed further at her light colored rose, turning it over between her fingers carefully and directing her glance to the boy and his rose. He was right in that it seemed the only option left for them was to venture out further into the looming maze and find a way out. The painting, if that had been where they had come from, obviously did not plan on letting them back in. So now they were left with nothing but these roses to find their own way out of this warped art gallery. Looking down at her hand which she had reached out to touch the painting, she glanced over it to make sure there were no wounds or pricks to it. Seeing no visible injury to it, she nodded her head. "Yes, I'm fine. The painting didn't get me," she replied. The last words sounded a little strange to her, since no one would think that it was possible for a painting to get anyone. It was supposed to be an inanimate object, completely harmless. It seemed that this place enjoyed bending the rules of logic. Just as she was ready to step forward into the maze, the girl paused and looked up at the boy again. "What's your name?" She asked. Since they would be traversing through this maze together, as it seemed, she thought it best to at least learn his name. Once she had asked the question, the girl suddenly realized that she could not recall her own name. This cast a slightly troubled expression across her face, and sent her thoughts swirling again. She could not remember her name, nor anything else about herself. It seemed that she had forgotten who she even was. This sent her wondering if perhaps it was an aftermath event caused by being brought into the painting (as she was unaware that she not been brought into the painting herself at all, but had been the one who had brought), and was just some form of amnesia. Was the boy also experiencing some form of memory loss? Would he remember his own name to tell her in answer of her question? The lavender girl watched the boy for his answer then, waiting to see if he would tell her his name, or if he would be struck with the conclusion of amnesia as well. taking one last glance at the painting that he believed, or guessed that they had come from, Rei took careful note of how it looked. the roses scattered in it, doing his best to plant the image of it into his head. just for future uses, no one would ever know what would happen later on, especially in a place like this. covering his mouth with his hands, something he used to do when thinking, he silently nodded hearing the girl murmur "yes, the museum". at least they came from the museum, he could most likely put a small amount of trust in her. it wasn't that he didn't want to fully trust her, it was that who knew anything about this? it all seemed like some kind of nightmare. after a pregnant silence, Rei finally cleared his throat, which had felt stuffed. "what really is making me worried, is the fact that the painting moved." he lowly muttered, still staring at the painting. "it makes me worry if there are other paintings that'll start moving." there was a clown painting back in the gallery, that really did get Rei nervous, and if this was somehow a cruel version of that gallery... what would the clown do? finding this thought silly, he shook his head trying to laugh this off. "mm." Rei hummed in response, seeing her hand seemed fine. he was trying to change the subject of his thoughts to something else. hearing her question, Rei racked his mind wondering to give his real name, or some made up alias, or just refuse to say it at all. was someone else listening to their conversation? was she some kind of spy? but who would want to spy on him? "Rei." he gave his name, with slight hesitation and a heavy breath at the end of this. what was a bad decision when he was already trapped in here anyway? "well, we should get a bit more comfortable with each other if we're going to spend the entire wandering of the maze together i suppose.." Rei forced himself to say, putting a faint smile on his face. "Yasashii Rei. i usually just go by Rei though." he was stuck with what else to say to break the ice, really they seemed to know enough, and it would take cooperation and most likely partnership to get through this. or not, it could just be some sick game, or his imagination. looking at the troubled expression on the girl's face, Rei tried not to question this, but studied it. 'why would she be making that face, as soon as the topic of names is mentioned?' he questioned himself, before deciding to let it go. "you don't have to give your name, i hopefully can trust you with mine though." he slowly said, starting to walk already but also seemed to be waiting for her as well. "i mean, it would be a bit more fair if you did give your name but some people are uncomfortable with names." Rei appeared to be stumbling over his words, nervously trying to come off as not rude, and a polite accepting person. of course, mistakes would be made. breaking his gaze quickly, Rei stared forward eyes glued to the on going hallway as he slowly made baby steps toward it. The girl had never thought of that before - that perhaps the paintings around here would start to move. The painting of the roses, An Impossible Dream, had moved and even reached out to seemingly cause harm by grasping her hand in its thorny embrace. That being understood, it would only make sense to her that the other paintings were apt to start moving as well, as though some sort of magic spell had been cast upon them that gave the inanimate objects the power to suddenly come to life and move around. Glancing down the hallway of the warped gallery, she peered at the paintings that were hung there, wondering if going past them would even be a safe thing to do. The more she thought about it, the more apprehensive she became. It might be a stupidly dangerous thing to do.... And she wondered if there wasn't another way that they just weren't seeing. A quick glance around said this probably wasn't the case, and that, if they wanted out of here, then the two would have no other choice than to traverse the maze and see what happened. If the paintings started to move, then hopefully they could avoid any fatal run-ins. And, as if on cue with that thought, the girl's gaze dropped to the rose in her hand. She wondered once more over the importance of the flower, but decided they would probably find that out as time went on as well. Honestly, the more she thought, the more questions that popped into her mind without any answers to resolve them. It was frustrating, but this entire situation was entirely off-putting as well. Turning her gaze to the boy when he gave his name, the girl would have normally smiled a bit and returned his answer with her own name. But she could not remember it. No matter how hard she tried to conjure up the memory of her name, it remained far away and out of her grasp. It was disconcerting to say the least, and it worried her that she could not remember her name. She had hit her shoulder when she had fallen to the ground, not her head. A concussion was out of the question, because she expressed no symptoms of that. If Rei could remember his name, then why couldn't she remember her own? Much like this maze, it didn't make sense to her at all. With her brows furrowed slightly in hard concentration, the nameless girl stepped after Rei as he started his way into the gallery maze. She wanted to get started on their journey through this place, but she was so very caught up in the fact that her name had completely escaped her. How did one forget their own name? It seemed like something that was impossible. Of course, she knew that it was possible, but it seemed unlikely for her - even in this situation. "You're right.... It would only be fair," she responded quietly, her voice sounding troubled and confused. The girl looked from the boy to scan around the gallery in front of them, as though her name might be painted somewhere on the walls. It wasn't, of course, but she figured that she might as well put her gaze somewhere else for a moment. "But I can't remember my name at all," she finally said, reaching up with her hand to rub the back of her head almost nervously. If she was going to have to endeavor this maze - which could be potentially life threatening - she would have at least liked to do so with the full knowledge of what her name was. But it seemed even this was stolen from her. The more she thought about it, however, the more the lavender girl realized that she couldn't remember much of anything about herself. She couldn't remember what her name was, her past, not even what she looked like. "I-I can't remember a single thing about myself...." Her words drifted off at the end, obvious concern and worry intermingling with her tone of voice. This certainly wasn't a good sign, and she wondered if it would somehow hinder her ability to escape this maze. She didn't see why it would, but anything could happen here in this place that defied all rationality. Looking up at Rei, her troubled expression - now riddled with worry - was far more obvious now than it had been before. seeing her expression grow even more confused as well as troubled, Rei knew this hit a sensitive thing. how could be so thoughtless? some people hated giving their names! about to spew out a list of apologies, he listened to her explain that she couldn't remember her own name. "what? oh.." Rei mumbled under his breath, wondering if she was angry at him for asking. "really, it's fine. some people can be put into a marriage and won't even know each other's names until they, uh.. meet." 'where are you trying to go with this?' biting his lip deciding that shutting up was the best thing to do in such a situation like this, a faint shade of red came onto his cheeks, humiliated at what he was doing. turning away, he covered the lower half of his face with both hands, eyes staring ahead down the hall. although, he flinched when he heard what the girl said next. 'she can't remember anything about herself?' tilting his head, he glanced over at her not removing his hands from his face though. "w-what? did something happen when you got here?" she seemed fine, he didn't think she fell on her head, either way it wasn't much of a fall.. did he hit her when he landed? "e-er, you seem fine though.. do you feel sick or.." stopping his rambling, Rei twiddled his fingers anxiously. just as he was about to speak up once again, a loud crash interrupted his thoughts. eyes widening as he accidentally gave poked his hand with his rose's thorn, his head snapped to get a better view of the direction the noise came from. chewing on his lip, his eyes peered down the hallway which seemed to grow more dim and horrifying the longer he looked at it. but just after a few minutes of silence coming from there, the creak of a door that really needed to be oiled came, making Rei want to scream and cry. 'crapcrapcrap don't say anything, don't show anything, it's just a door..' his face a unreadable poker face, Rei simply broke his gaze and rubbed his eyes, just waiting for the girl to answer his question about the name, or suggest running. he would be happy either way, anything to start moving. 'what made that noise though?' a painting? a mannequin..? oh no, this was already turning into some messed up hellish nightmare. The girl blinked her eyes, wondering for a moment what an arranged marriage had to do with her forgetting her name; however, she supposed that it was a relatively adequate comparison... She didn't know her name, and some people didn't know the name of the person they were to be married to. It all wrapped up into an ignorance of a name. In this case, it was her own name. The girl could not fathom why someone would forget their own name, especially without a reason. She knew she hadn't hit her head, because if she had hit her head hard enough to wipe the memories of herself away, then surely she would be suffering from a major headache right now. But she wasn't, so what was going on? Was it because of the room? Again, this didn't make much sense simply because Rei had all of his memories intact. The more she thought about this, the more confused she became. The loud crash jerked the girl's attention, her head lifting to look in the direction of the sound. That didn't sound good. A jolt of nervousness shot through her body, and she could only dread what might have made that sound. Certainly nothing good. "Yeah, I heard that," She answered, her voice small as her gaze remained locked on the direction the crashing sound had come from. She didn't mind what Rei said, knowing very well that surviving this world was much more important than remembering herself. If they managed to get out, then perhaps she would find her memories again. At the mention of coming up with something to call her for now, the girl was again brought to a mental halt. She couldn't think of anything. If she had known more about herself before this, then perhaps she could have come up with some sort of nickname, but seeing as how she knew nothing of her self, then she was at a blank page of sorts. "I don't know..." She answered. "Let's just get out of here." Perhaps she would think of something as time went on, perhaps when her mind wasn't so focused on the crashing sound, when she wasn't feeling so freaked out. Rei awkwardly shifted where he stood, slightly impatiently on the inside as the girl remained silent, probably trying to think about things. He didn't blame her, if he couldn't remember his own name he would be taking things way more slower than he ever would before. "Alright, that's good at least. It would be worrisome if anything did happen to you." Rei sighed in relief, hearing her say she was fine. 'But now we can't link up your lost memories with that...' Going silent, he didn't hear her say she was fine, too deep in thought and not paying attention. Staring down at the ground, he thought about the situation trying to keep a journal in his head of all the information he currently had. 'I'm stuck in a museum, maybe a alternate dimension of the one I was in, with a girl who doesn't have any memories of her name. The paintings can move, and can injure you, possibly.' Wait, could he die in here?.. Paling at this thought, Rei gulped trying not to think of that anymore. Hearing what the girl had said, then nodding. "Well at least I'm not imagining things then." Rei mumbled, not knowing whether he should be thankful that she heard or not. That meant it was definitely real, and something definitely had happened. If only he had heard it at least it was possibly only his imagination. "Yes, that sounds good to me." Rei said, pondering reality and everything that had happened to him in his life. 'I'm beginning to wonder if I was even born.' He blandly thought, face expressionless. "Although, it concerns me that the only way we can go is the where the crash came from." Rei sighed, pondering if that really was the way or not. 'I'm going to hope and dream that that thing that made the noise is locked in a room that is off privileges.' Biting on his bottom lip nervously, the male pondered on what was safe. "I suppose I'll go on ahead." Rei cleared his throat, trying to pull off the whole brave act when really his insides felt like they where coming out his nose which really hurt. And it was a nauseating thing to vision. Holding his aching sides, Rei slowly walked over shakily to the hallway, finding it much larger than he did before. Looking around carefully, taking a mental snapshot of the area, he cautiously took another few steps down, the walls covered with still paintings that felt as if they where boring into his body. "I don't think it's dangerous, but it doesn't feel safe too.." Rei mumbled, almost as if he was talking to himself. Suddenly after a bit of walking, there was a curve in the hallway leading to a more dimly lit area. 'Oh joy. "Do you think.." Rei stopped himself from talking, not knowing what else to say, left speechless. The sound of something creaking didn't attract him, neither did how dark it was. He always hated the dark, he hated sleeping and all that. It would be humiliating to admit that to her though. It would have been quite troublesome if the girl had been hurt, as it would most definitely hinder their progress in getting out of here. There was also that moment of thought when she wondered if Rei would have left her had she been injured. It wasn't a serious thought, and she didn't see him as that sort of person, but the girl knew there were people out there who would leave an injured person alone. Again, this thought wasn't so much a serious one, and just a moment of musing as she contemplated what their predicament might have been like should she - or either of them, really - had been injured. It seemed that, even in this forsaken place, even they managed to have a bit of luck on their side. Who knows what they were going to encounter in these hallways, and it might have been made ten times more difficult should one of them be suffering from an injury of some sort. There really was a silver lining in every situation, no matter how hard one had to look to find it. Looking from the hallway to Rei, then back again, the girl nodded her head. Whereas hallucinations were probably likely in a place like this, it was nice to know that the crash hadn't been one of them. But it was a double-edged sword, because that meant that someone, or something, had made that crash, and that thing could be hazardous for them. The nameless girl wondered over what awaited them further in, what horrendous things would present themselves. It would have been nice if they could have just walked through the maze without interference, but this wasn't a perfect world, and it definitely wasn't going to let them escape easily. At least, that is what the dreaded thoughts floating in the girl's mind was telling her. "It certainly isn't a comforting thought," the girl muttered in reply. It would have been better if there had been some sort of detour that they could have taken, one leading them away from the crash. "But I guess it's not a surprise." What in this world would be easy? Just be the abandoned, dark appearance of the place was enough of a clue-in to let them know this place was not their friend. It was worrisome, but fretting too much might be a bad idea. Watching Rei as he walked ahead, the girl paused just a moment. She followed after him a few paces behind, her gaze concentrated on the space around her. She felt as though every step was dangerous, like the floor would fall out from beneath her or the walls would cave in if she so much as breathed. It was an unstable feeling, fitting for such a place as this. Even so, it didn't help to calm her nerves at all, and the girl found herself walking a little faster to keep close to the other. "I feel like we're being watched," she said quietly, her nervousness slipping into her voice as the forgotten girl glance around. It felt like the paintings, no matter what they were of, were watching their every step. Even the walls seemed to be observing them - a truly unnerving feeling. Looking forwards to the oncoming area, she felt her heart sink a little in her chest. There was even less light there, creating more shadows. It was surprising, kind of, that there were so many shadows of odd shapes. It didn't seem to fit the layout, but then, perhaps applying logic to this place wouldn't be beneficial anyway. "Do I think what?" She asked, voice small as she listened to the sound of something creaking. Glancing over her shoulder, the girl searched the area behind them, waiting for something she wasn't even sure was coming. And again, she turned her gaze ahead, repeating the same motions of watching and waiting.